To a thirsty dog or cat, antifreeze can look just like water. Unfortunately, it can cause severe symptoms such as seizures immediately upon ingestion. It also takes less than a capful to be fatal to pets. Be sure to keep your pet away from the driveway if you know that your car drips antifreeze, and keep whatever you’re not using stored on a high shelf in the garage. It seems like we just got past Valentine’s Day. Now it’s almost time for Easter and the chocolate treats that come with it. While this can be an occasional sweet treat for humans, dogs or cats should not have even a small amount. Chocolate contains an ingredient called theobromine that can be difficult for pets to digest. Mild symptoms include diarrhea and fatigue. However, pets eating chocolate can also cause serious symptoms like respiratory distress, high blood pressure, tremors, and cardiac arrest. Spring cleaning is an annual event in many households. Before you get started, place your dog in a kennel or your cat in another room to avoid a curious pet from ingesting toxic substances. Dishwashing detergent and cleaners for the toilet, oven, and drain can be particularly hazardous. Signs that your pet might have gotten into your household cleaners include drooling, lethargy, fever, lack of appetite, and pawing at her mouth. Lilies are an especially popular springtime and Easter plant. Certain types of lilies, including Asiatic, Day, Easter, Japanese Show, and Tiger are extremely toxic to cats. Eating just two or three petals can result in kidney failure. Calla, Peace, and Peruvian lilies typically cause minor symptoms such as drooling. In either case, be sure to seek prompt medical attention for your cat. 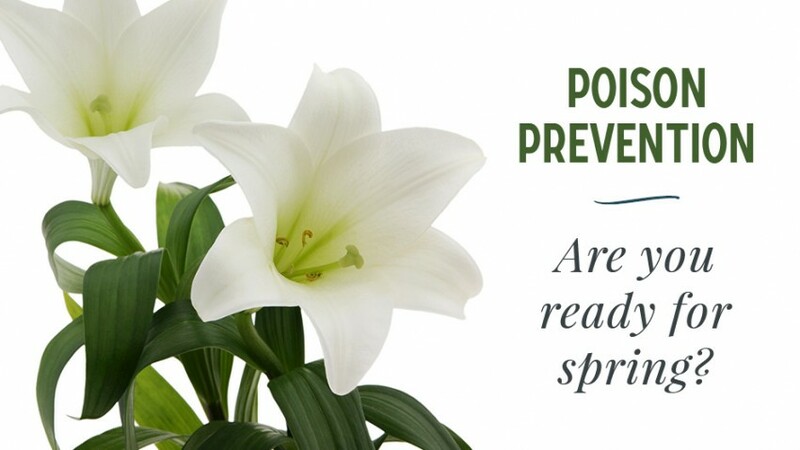 Lilies can also be toxic for dogs but to a lesser degree. It’s exciting when you can start working in the garden again after a long winter. You just need to be careful when you have a pet since weed killer and certain garden supplies can be hazardous to his health. If your pet licks a plant you have sprayed with weed killer, symptoms of illness such as vomiting and diarrhea could start right away. Cocoa mulch also contains harmful properties for pets. If you do choose to use it, consider placing a fence around the area so your pet can’t access it. Slugs are pesky critters that can ruin your garden in a hurry. To prevent this, many gardeners use slug bait that contains metaldehyde that kills the slugs by causing dehydration. With household pets, the ingredient can cause tremors that increase body temperature and can cause death to muscle cells. That can lead to kidney failure and eventually death of the animal. Please don’t wait to seek help if there’s any possibility your pet could have ingested slug bait. Xylitol is an artificial sweetener found in many foods, including sugar-free candy. With Easter coming up, we encourage you to keep all treats out of your pet’s reach whether they contain Xylitol or not. It’s far better to take a preventive approach than to have your pet become extremely ill after trying to sneak some Easter treats. Glencoe Veterinary Clinic is always available to answer your questions about poison prevention or any other area of pet care. You may contact us at 320-864-3414 if you have an emergency or need to make an appointment for your pet.